It has the one to power up, but after that comes only the information about its moves. Oh, I see, I have to read more, haven’t known this special behavior. Out of curiousity, from what kind of egg did you hatch that Combee? 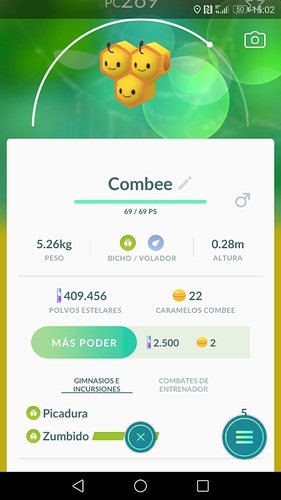 it says on the Silph Road that NO ONE has hatched a Combee yet, out of a total of 4679 eggs (all eggs combined), so you hatched the RAREST egg hatch in pokemon go right now. I hatched a Combee last night. It was female. Yeah, mine was from a 5K egg.